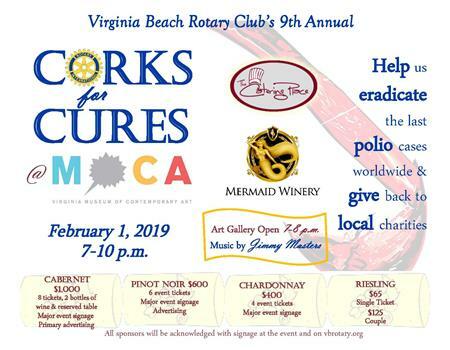 This is our 9th Annual Corks for Cures event. Great food will be served by The Catering Place and Wine by Mermaid Winery. 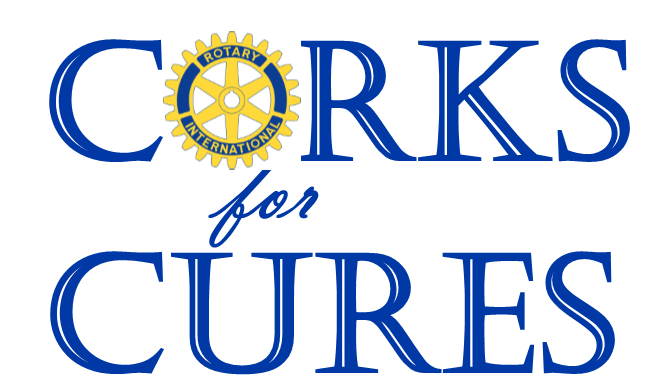 Funds earned will help Rotary International eliminate Polio from Planet Earth once and for all, as well as several Local well-deserving charities. Come have some fun with us! The art gallery will be open to our guests from 7-8 p.m. There will be a jazz group headed by Jimmy Masters playing throughout the evening and a Silent Auction. Sponsorships are welcome! 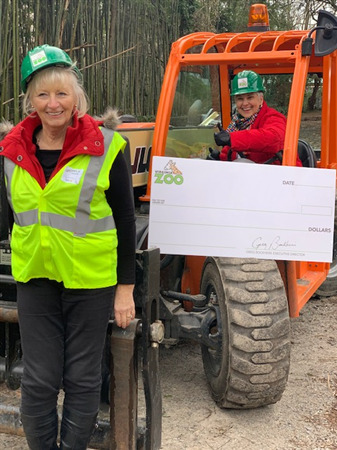 The Rotary Clubs of Norfolk, Norfolk-Sunrise, Virginia Beach and the Rotary Club of Hampton Roads applied for and received a grant from District 7600 to create a Nature Play area at the Norfolk Zoo, as well as act as ongoing helpers with horticulture education programs. 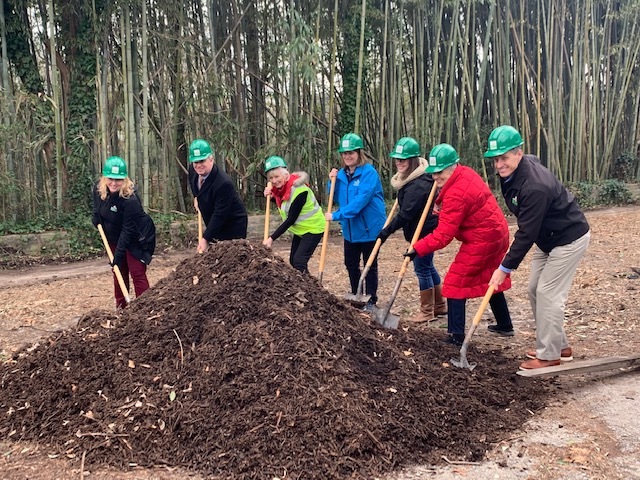 In the photo below, the participants from left to right are: Angela Benard, Director of Development of the Virginia Zoo; Hearst Vann of the Virginia Beach Rotary Club; Lorna Cochrane, of the Rotary Club of Norfolk; Michelle Lewis, Education Manager of the Virginia Zoo; Lori Lampert, Operations Manager of the Virginia Zoo; Pamela Tubbs, Rotary Club of Norfolk; Greg Bockheim, Executive Director of the Virginia Zoo. — at The Virginia Zoo. We mourn the loss of our fellow Rotarian and Past President, Bob Scott, on August 1, 2018. Stay tuned for upcoming meetings and events beyond the end of June, 2018. Curtis Brown, Jr., of Green Run High School was honored on May 18, 2018, as the recipient of the Brickell Scholarship. Abby Ramsay of Bayside High School was announced as winner of the Richard A. Schlimgen Student Leadership Memorial Scholarship. 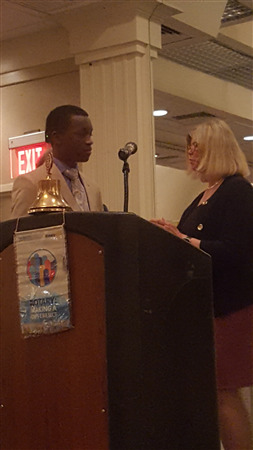 Robert Tillman, IV, of Tallwood High School was announced as winner of the Jim Spore Community Service Scholarship. Check out the fun we had visiting the new Mermaid Winery location on Shore Drive! Long-time Virginia Beach Rotarian, Pat Bridges, passed away on October 18, 2017. Pat had 52 years of perfect attendance in Rotary. 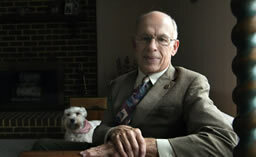 Click here to read his full obituary. We'll miss you, Pat. See below for more information about past meetings (March 2017 - July 2017). On November 18, members joined other community volunteers to fill 2,100 care packages for our military heroes. Our 2017 Grantees have been announced! 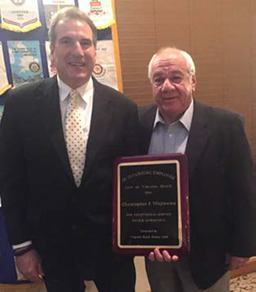 This year we honor Wayne McCoy and Tony Pirrone as City and School Volunteer of the Year, respectively. Read about the great work these men do to serve our community. 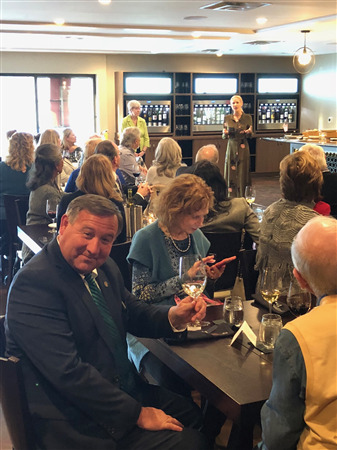 Thank You 2019 Corks for Cures Sponsors! Thank You 2017 Corks for Cures Sponsors! Check out what we've been doing each Thursday! See below for more information about past meetings (Jul 2017-Dec 2017). Perfect Attendance for 26 Years! 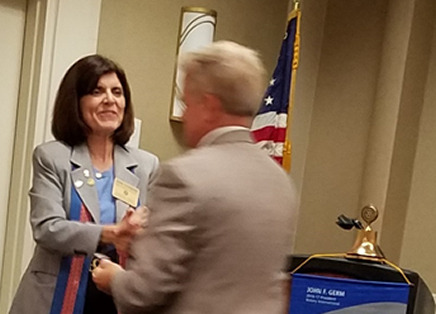 During her visit to our club September 8, District Governor Diane Hagemann awarded club member Bud Satterwhite with his Pin for 26 years of Perfect Attendance! Congratulations, Bud! By collaborating with three other regional Rotary Clubs, we were able to maximize the grant we received from the District to help support literacy among youth in area shelters. 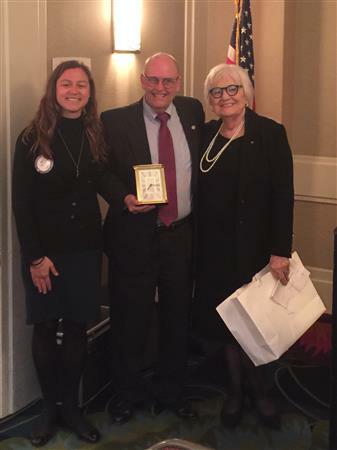 (L – R) Norfolk Rotary President Bryce Burton, Reading Enriches All Children (REACH) Executive Director Lori Miller, Town Center Rotary President Pat Edwards, Portsmouth Rotary President Calvin Molen, and Virginia Beach Rotary President Amy Kurtz. The four Rotary clubs joined together to apply for a District Grant for the REACH program and received the $20,000 award! The photo shows Lori's reaction to being presented with this great news. With the funds, she will be able to purchase many new books for her reading programs, as well as update some book shelves, purchase bags for the children with the Rotary logo, and other items to support the program which encourages the literacy needs of at-risk and homeless children in our community. Our 2015-2016 City Employee of the Year is Christopher J. Wojtowitz of the Virginia Beach Public Works Department. (L - R) Chris was nominated by Kal Kassir, Chairman of the Bayfront Advisory Commission. Chris is Project Manager of the Lesner Bridge Project on Shore Drive. He has proven to be a highly effective liaison between city government and the residents and business people of the Shore Drive Corridor. 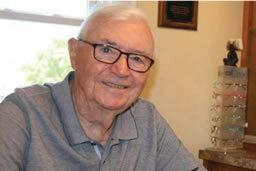 Learn more about Rotarian Bernard "Mac" McNamara and the great work he's done for our community over the years by reading this Close Up feature by Cindy Butler Focke. Our 2015 - 2016 Volunteers of the Year are Kurt Williams and Anne Bright. Keep doing great things! 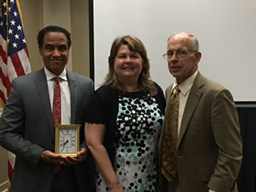 (L- R) Kurt Williams was nominated by White Oaks Elementary Principal Stephanie Haus. Joining them is Dan Edwards.